Your mate’s wedding is something which is very special for you, right? Seeing your childhood friend with whom you did all those teenage pranks and fun as a beautifully dressed bride or an elegantly attired groom is really an amazing feeling. But, in this contemporary world, most of the times we’re not able to attend that most awaited wedding. Well, thanks to our hectic work schedules and tiring office hours. But if you’re not able to attend the wedding, you can atleast send a token of love as a present to him or her. This will be like your remembrance for your friend on his or her big day. And what else can be better than a fresh and alluring bouquet of flowers? When it comes to sending flowers as a wedding gift, the breathtaking all time symbol of love- red roses, are the best. Isn’t it? So, a whole bouquet of stunning red roses will be perfect. In that context, you can send roses online to your friend which he or she’ll definitely love and would be truly a unique present for your bosom companion. But, the thought of sending flowers online sometimes create a lot of scepticism in your mind, isn’t it? So, many questions like will they surely deliver in time? How would be the quality of the flowers? Will it cost you more? etc. make a hustle bustle in your mind. So, today I am going to list out some features that you should look into while buying and sending an exhilarating bunch of wedding flowers to your friend. Even though roses are something which are an ultimate beauty package in their own but still a good presentation is something which is very essential. You would obviously not like to send wilted or rumpled flowers, right? Your friend would rather not like to see some exotic roses in an unattractive vase. That’s why when you’re sending a bouquet of roses or say any other flowers, you should be cautious about having a nice presentation. Will it make any sense if your present reaches to your friend after a day of his or her marriage? No, right? So, make it very sure that it reaches on time. You’re not able to attend personally with some flowers from brick and mortar shops, that’s why you’re sending online. But, that doesn’t mean it shouldn’t reach by time. So, consider this factor very prominently. When you’re sending a bouquet online, make sure to keep a track of the freshness of the flowers. A bouquet full of drooped or crumpled flowers would certainly not please your friend, right? You’re paying quite a good amount of pounds and also you’re sending to someone who is close to you on his or her wedding day. Aren’t both the reasons worth enough for you to get the best? So, always take care that the flowers should be handpicked and fresh-cut when the bouquet reaches to your friend. Your inability to attend your confidant’s nuptial day is a matter despair for both of you. But, a meaningful note with the bouquet would certainly give him or her a feeling of happiness and make your friend realize how special he or she is for you. You can also express your feelings about him or her which you thought of sharing while raising the toast on the wedding day. So, make sure you add a note to your bouquet with all the sentimental writings. It would definitely bring a smile to your friend while reading. It’s yet another important factor while choosing an online florist to send a gorgeous bouquet of wedding flowers to your friend. A company with a good background can give you a sigh of relief about everything starting from quality of flowers to a proper delivery. You should make sure that the company has an efficient customer care team to solve any kind of queries that you might have. 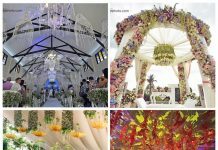 So, make the whole experience of sending a bouquet full of exquisite and ravishing wedding flowers to your friend on his or her wedding day a completely alluring episode. And the tips that I’ve mentioned above will certainly help you to do so. What Are You Doing For The Coming Up Valentines?